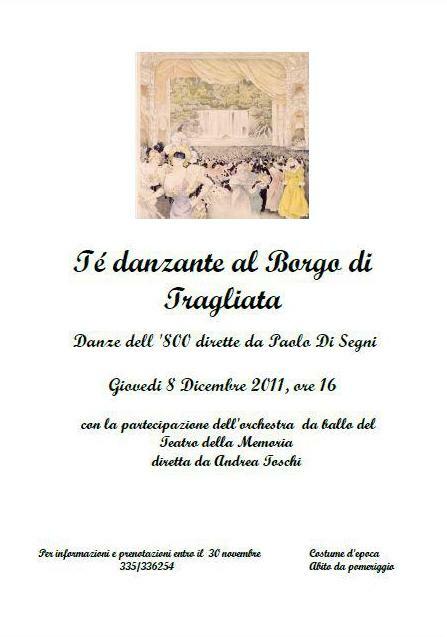 The charming Borgo di Tragliata, located in the Roman countryside, will again host the Tea dance organized and directed by Paolo Di Segni. Ladies and gentlemen will dance to the accompaniment of the Orchestra da Ballo del Teatro della Memoria led by Andrea Toschi. It’s a precious opportunity to spend an afternoon among art and nature, tasting the scrumptious buffet della casa and dancing to the strains of the most loved classics of 19th Century ballroom dance as well as to rare pages by other composers of the late Romantic era. 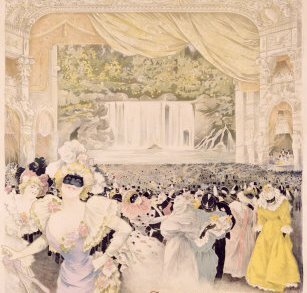 The dances in the program range from forms that will involve all the audience under the guidance of the Maître de danse to quadrilles for dancers more experienced in this intriguing repertory. Guests can attend an introductory class given by Mr. Di Segni from 10,00 to 13,00 on the same day. For information about reservations download the playbill.